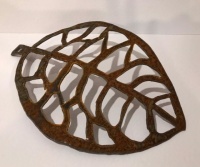 Hand forged metal leaf by Juniper House. 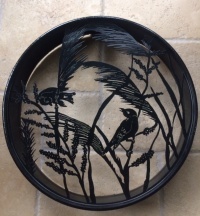 Designed to hang or lean on a shelf or against a wall. A gorgeous rustic piece with a traditional green tone that can be positioned inside or outside. Approximate size at longest point approx 30cm. A unique one of a kind piece so multiple purchases may vary slightly.